Summary: The description, specs, photos, pricing and user ratings for the Inland Manufacturing M1 Advisor pistol. The Inland Manufacturing M1 Advisor is a chopped and shortened version of Inland’s M1A1 Paratrooper, a WWII replica carbine. Both guns are chambered in .30 Carbine. 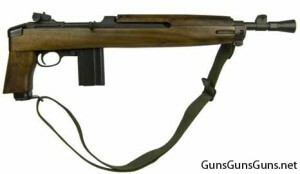 The M1 Advisor from the left. a military-style carry strap that connects to the pistol grip’s base and the barrel band. Inland Manufacturing will reportedly begin shipping the M1 Advisor in March 2016. .30 Carbine 10+1, 15+1, 30+1 12″ 21″ n/a n/a 4.5 lbs. The M1 Advisor from the right, with the sling. This entry was posted in .30 Carbine, $1,001-$1,250, Full size, Inland Manufacturing, Semiauto on January 20, 2016 by Staff.